On October 10, 1912, the International Order of Odd Fellows, UCAL Lodge #608, gathered at 1716-18 Fourth Avenue to lay the cornerstone for their new $50,000 building. In January of that year, when the building was still in the planning stage, it had been reported that it would cost only $20,000. Odd Fellows from across the state came to Rock Island for the ceremonies that started with a parade featuring the Odd Fellows orphans home marching band brought to town for the celebration. Previously the Odd Fellows had met in the upper stories of the London building on Second Avenue, now the home of the Quad City Arts Council and Gere-Dismer Architects. Odd Fellows originated in England in the first half of the 1700s, where noted author Daniel Defoe (Robinson Crusoe) called the lodge “a place where very pleasant and recreative evenings are spent.” A century later, the organization came to America where it was dedicated to caring for the sick and aged, widows and orphans. Rock Island’s first Odd Fellows charter came in 1846. The three-story, 45 x 150 foot, “Black Hawk pressed brick” building shown on this souvenir postcard was an imposing presence on a previously smaller scale residential block. Notice the windows in the side walls – they indicate that there were no adjacent structures. When completed on April 1, 1913, this was a visual signal of the expansion of downtown for commercial and business use. Fraternal and benevolent organizations of all kinds were expanding and thriving as well during these first decades of the 20th Century. A new Masonic Hall was under construction at the same time, the Elks had recently moved into their new building, and the Eagles would soon begin their own new home. Here, the ground floor was designed as an auto salesroom and repair facility, leaving the upper two stories for the Odd Fellows and their women’s auxiliary, Eudora Rebecca Lodge No. 78. The postcard shows a central doorway which led to the stairway with a wider garage door to the right. The signs on the postcard image say Yeggy-Don Sales Co. City directories call it the Don Company and it sold Chalmers autos. If you look at the postcard closely, you can see a pair of headlights in the left storefront window. This block was booming with growth. By the mid 1920s, a new Argus publication building was constructed on the east side of the Odd Fellows, while the Don Company had a new building on the west, where they sold Packards, Reos, and Reo Speedwagons, as the Reo truck was called. Other auto dealers continued use of the Odd Fellows garage, including first Winter & Hay and later Economy Motor Sales, which sold Chevrolets. The Odd Fellows kept the two upper floors for themselves. The second story had a huge dance and convention hall that measured 102 feet long, while two smaller lodge rooms were in the front portion. The third floor held reading and card rooms, a pool and billiards hall, as well as two other large meeting rooms. 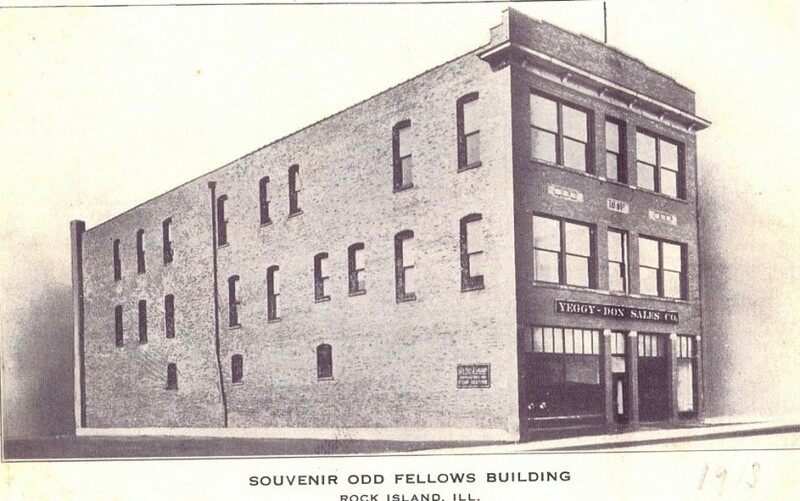 By 1930, perhaps signaling hard times and dwindling membership, the Odd Fellows opened part of the upstairs as the Fourth Avenue Skating Hall. Only a few years later, both they and the skating hall had disappeared from city directories, and several camps of Modern Woodmen of America were using the upper floors. In December of 1941, the Argus published a picture of this building and noted it was being remodeled by architects Cervin & Stuhr and contractor Weismann Construction Company, for its new owners the Loyal Order of Moose. Front was of colored enamel bricks and the windows were made smaller. The main entrance was still in the center. Under Moose ownership, the ground floor held roofing and insulation companies for a time, then was home to Lerch Business Machines and Klein’s Office Equipment. The Moose remained here until 1962, when they moved two blocks west. The vacant building was then demolished. A few years later, its old Don Company companion to the west was also vacated and demolished. Now the Argus building stands alone on that block of Fourth Avenue. The rest is a parking lot. This article by Diane Oestreich is slightly modified from the original, which appeared in the Rock Island Argus and Moline Dispatch on March 16, 2003.